In this elegant and enlightening presentation, award winning author, educator and performing artist Sharron Rose introduces the feminine – based Yoga of Light, an ancient science and spiritual practice of physical and spiritual revitalization. Rooted in her extensive research and first-hand experience in women’s mysteries and the mystic arts of Tantra and Alchemy, Ms. Rose introduces a system of yogic training based upon the unique dynamics of the female energy field. This consists of meditations for relaxation and stress reduction, visualizations for cleansing, restoring and protecting the physical body and luminous energy field that surrounds it, mudras (sacred gestures) designed to depict the flow of subtle energy through the luminous field, and exercises to enhance visionary capacity and align women with the most powerful and profound feminine role model – the Great Goddess. Segments include: Yoga of Light, Cleansing the Luminous Body, Igniting the Inner Fire, Awakening the Serpent Power, Opening the Heart and Healing the Luminous Body. 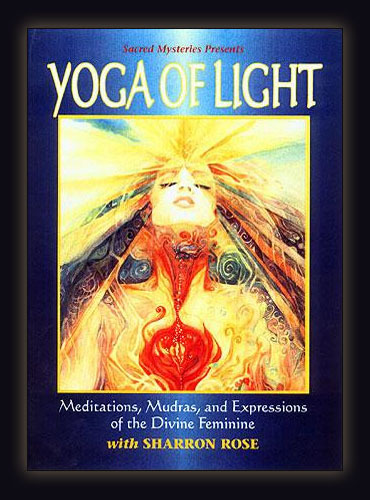 "Instructed by author and educator Sharron Rose (whose experience includes many years researching the Divine Feminine), Yoga of Light is a fascinating exploration of yoga with an emphasis on the female energy field. The DVD features a series of meditations, mudras, and visualizations that focus on restoring and cleansing the body, while at the same time helping one connect with the Great Goddess. Other benefits that can be derived from these spiritually powerful exercises include stress reduction, self-expression and physical revitalization. Rose is deeply knowledgeable. 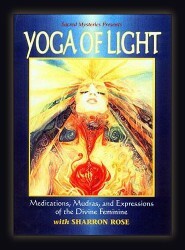 Segments include “Cleansing the Luminous Body,” “Igniting the Inner Fire” and others." "Sharron’s techniques for working with Tantra are both practical and powerful. Her knowledge of the Goddess is deep-felt and genuine; her manner sincere. Her poetic Goddess imagery filled me with positive feelings about my spirituality and myself. Listening to her opens doors in your mind, and you wind up understanding more about yourself than when you started."." "Will raise the feminine power to the level of conscious use in the twenty-first century. Exploring the true nature of women's emotions the visualizations and meditations are unique and imaginative, as well as effective. We have used many feminine ways throughout history, this points them out and makes them tools we can practice and draw upon in our times of need."."